Rental prices in Malta have been high for the last couple of years. If you’re not earning big bucks, you most probably can’t afford to rent an apartment in Malta on your own. It’s recommended that you don’t spend more than a third of your income on rent. That would mean you would have to earn over €2,000 a month to be able to afford a one-bedroom apartment in Malta by yourself. Or more, if you want to live in a popular area such as Sliema or St Julian’s. Sharing with flatmates is by far the cheaper option. Rooms go for anywhere between €200 and €600, on average. Of course, the price will depend on the area and the apartment itself. 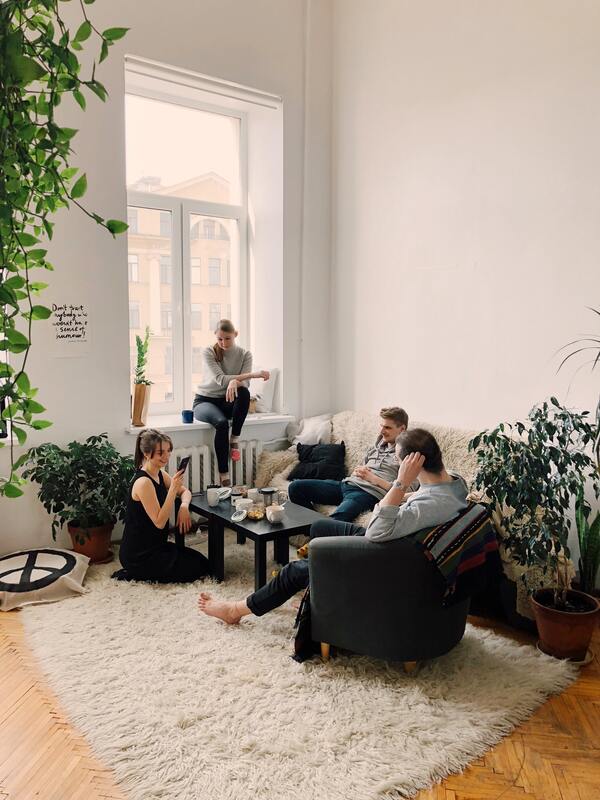 If you are thinking about renting a room in a shared house or apartment, you’re going to need to get along with your flatmates. This isn’t always going to be easy but, if it saves you money, then it’ll be worth it. Hopefully, you will be sharing with some lovely people who will end up being your friends for life. Whether or not you make friends with your flatmates, it’s still important to be polite and respect one another. We’ve assembled some of the internet’s best tips for getting along well with your flatmates. It goes without saying, of course, that you shouldn’t go in your flatmate’s room without permission! Pay your share and pay on time. This is probably the most important rule whenever you’re living with other people. You are responsible for your own share of the rent and bills. Just because one of your flatmates earns more than you, doesn’t mean they should pay more. They don’t work to help you out financially. Also, if you don’t pay on time, your roommate(s) will have to cover you. Most likely, unless you rented out the apartment with your friends, you won’t know your housemates very well. They don’t owe you any loyalty and they aren’t responsible for you. No one wants to live with someone who doesn’t pay their way or expects other people to cover for them. It’s basic etiquette. In common areas, such as the kitchen, bathroom and living area, just clean up after yourself. When you cook in the kitchen, wash up your dishes before you sit down to eat. Your roommate might want to make dinner, too, and they shouldn’t have to clean up after you before they can start cooking. Wipe up any spills you make and put back anything you use. In the bathroom, rinse the shower out when you’re done using it. Oh, and don’t forget to clean your skid marks! Basically, leave the common areas clean and how you would like to find them. Make an agreement over chores. If you don’t make an agreement or some kind of chart, there’s no doubt that household chores will end up being a source of tension. Inevitably, one person will feel like they are doing more than everyone else. More than likely, that’ll be true, too! Talk to your flatmates and decide how you’re going to share the chores. It’s not fair for the same person to always end up cleaning the bathroom or taking out the trash. Take it in turns and share the load. If you still can’t agree, then you can always get a maid to come once a week. Between you and your housemates, it won’t be a lot of money. Let your flatmates know when you’re having people over. Sometimes, people have an agreement that they will ask their flatmates before they invite people over. If you have made such an agreement, then make sure you honour it! If that’s not the case, then it’s still nice to let your roommates know when you’re having people over. It’s common courtesy. No one likes to walk in to a house full of people without any forewarning. Especially not after a long day at work. What’s more, you might both have decided to invite friends over on the same day and, if you don’t tell each other, then you’ll have a very busy house! Your flatmates won’t keep to the same schedule as you. Nor will they enjoy the same music! If you’re an early bird but your flatmates are night owls, then try to keep it down in the mornings. The same goes if it’s the other way around. If you know your flatmate is sleeping, then be nice and be quiet. Put headphones on when you’re listening to music or watching a movie, too. Neither of you will be able to enjoy what you’re doing if you can hear each other’s music or TV! In any relationship, communication is key. This is true of romantic relationships, work relationships and relationships between flatmates. If there is something your flatmate is doing or not doing, and you want the situation to change, simply talk to them. Don’t leave passive aggressive notes around, as this will just lead to resentment and tension. Be open and honest and try not to get angry when you’re talking to one another. This is another golden rule. If you want to use something belonging to one of your flatmates, then ask first. When you’re finished with it, put it back where you found it. Don’t use something without permission. If your flatmates do allow you to borrow something, look after it. Treat their possessions with as much care as you treat your own. In addition, if you have something that’s particularly important or meaningful to you, then let your roommates know that it’s off limits. They might not know something has a real significance to you. So, instead of getting angry at a roommate for touching or moving something important to you, let them know beforehand. Even better, if you have any prized personal possessions, keep them in your room. Even though your flatmates may know to keep their hands off, their guests won’t have any idea that that mug was given to you by your ex, or that vase was from your late grandmother. So, keep them safe in your room.